Large 19th-century landscape park forming picturesque setting to the Victorian mock Tudor castle occupying area of Glasbury's medieval open fields enclosed in the late 18th century, with remnant areas of ancient semi-natural woodland. Little ancient settlement evidence has so far been found within the historic landscape character area. In the earlier medieval period the area formed part of the kingdom of Brycheiniog and fell within the extensive ecclesiastical parish of Glasbury. Following the conquest led by Bernard de Neufmarché in the 1080s it formed part of the marcher lordship of Brecon. An English-held manor was established at Glasbury before the late 13th century. 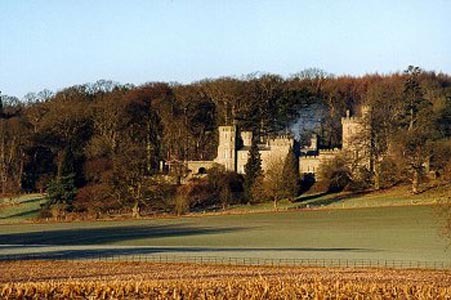 At the time of the Act of Union in 1536 the area formed part of the hundred of Painscastle in Radnorshire. In the mid 19th century the area fell within the tithe parish of Glasbury. The area occupies gently sloping ground, facing south-east, on the north side of the Wye Valley, between a height of 85m to 200m above Ordnance Datum. The soils are predominantly well-drained fine reddish loams which overlie sandstone bedrock (Milford Series). Present-day land-use is mostly pasture with some fodder crops, with areas of semi-natural ancient broad-leaved woodland on steeper slopes, as at The Nursery, including ash, silver birch, and oak. Settlement within the area is dominated by the service wing and stables of Maesllwch Castle, a Victorian mock castle in castellated Tudor style which replaced a former house demolished in 1729 and which had in turn replaced a late 16th-century house. The Victorian house was requisitioned for use as a Canadian hospital and by the Land Army in the second world war, the west end of the house being demolished when is was derequisitioned in 1951. Associated with the country house are a walled kitchen garden, a formal garden and wooded pleasure grounds, with former orchards and gardener's cottage and a lodge with associated gate piers and screen at the entrance to the eastern drive. Settlement within the area is otherwise largely confined to a number of dispersed stone farm complexes towards the eastern side of the area such as the 18th-century stone farmhouse and outbuildings and stone-walled yard at Maesyronnen, and the large late 18th to early 19th-century farmhouse at Glan-hen-Wye with its associated earlier 19th-century stone coachhouse and stables arranged around yard. The former 19th-century landscape park surrounding Maesllwch Castle country house, represented by scattered mature parkland oaks and chestnuts with some small conifer plantings, was probably first established in the 1770s, in association with a former house on the site, a ha-ha to the north-west and north-east of the house probably being of 18th-century date. The parkland is now subdivided into large rectangular fields with hedged and post and wire boundaries, part of the outer boundary of the park being defined by drystone walling. A number of older boundaries in the northern part of the area have multi-species hedges, including holly, ash and maple, with occasional boundaries on the higher ground formed of orthostatic walling. The western and southern sides of the area are bounded by more recent roads. The road to the south is a late 18th-century turnpike and the road to Ffynnon Gynydd Common on the west was resited when the parkland was created during the 19th century. The winding lane up to the common past Maesyronnen on the eastern side of the area is more ancient and runs in a hollow-way up to 1.5m deep. A milestone belonging to the turnpike period of road transport survives near Little Mill Cottages. Industrial archaeology within the area is represented by a former water corn mill known as Little Mill. This was in operation between the beginning of the 17th century and the end of the 19th century, taking water by means of a weir from the Cilcenni brook, a tributary of the Wye. Maesllwch Castle was provided with its own gas works to light the house in the late 19th century. Traces of the retort and gasometer associated with the production and storage of the coal gas still survive in the woodland to the east of the house. Maesyronnen Chapel and cottage, on the higher ground towards the eastern side of the area, is important in bieng one of the earliest surviving nonconformist places of worship in Wales. The stone-built chapel, founded in the 1690s, was originally a 16th-century cruck-built farm and barn.